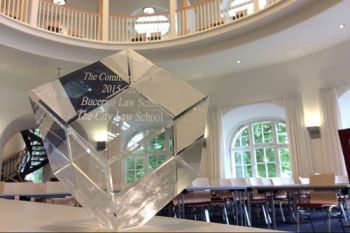 The City Law School’s Daniel Boon and Bucerius Law School’s Tjark Neumann are the winners of the 2016 Common Law Moot Cup. 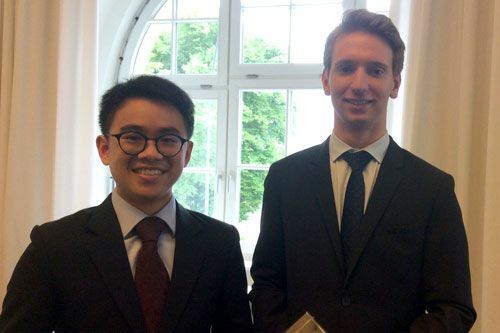 Daniel Boon, studying on The City Law School’s Bar Professional Training Course (BPTC) and Tjark Neumann, a law student at Bucerius Law School, Hamburg, are the winners of the 2016 Common Law Moot Cup having taken part in the world’s first cooperative moot. 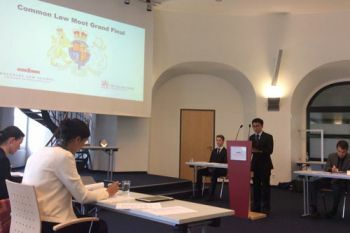 The moot finals were held at the Moot Court of the Bucerius Law School on 15th June. Presentation of the Cup and trophies was made by Dr Julia Baedorff of Clifford Chance, Germany. The runner-up team comprised Jonathan Friedrichs with Sian McGibbon. The semi-finalist teams were Finn-Ole Münchow with Laure-Astrid Wigglesworth, and Paul Plümpe with Kah Wei Goh. Both Law Schools benefited from this novel collaborative experience, which was at once fierce and friendly. Students presented their arguments in English about an international commercial dispute required to be resolved in accordance with English law. Lezel Crook, Bucerius' Director of Foreign Language Communication and The City Law School’s Moot Director, Joanne Moss, have declared the moot “a resounding success”.